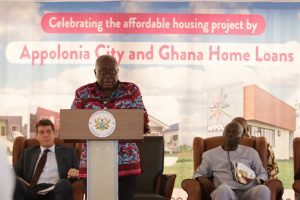 His Excellency President Nana Akufo-Addo has led the ceremonial ground-breaking of the first phase of a 2,000-unit affordable housing project financed by Ghana Home Loans at Appolonia City, Accra’s new city development. 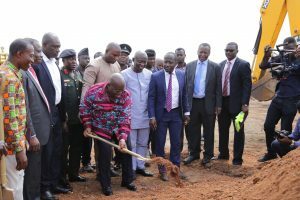 Due for completion within 18 months, the development is the first phase in a partnership between Ghana Home Loans, the country’s leading mortgage finance provider, and Appolonia City, Greater Accra’s new city. The project will benefit from Appolonia City’s high-quality infrastructure, including tarred roads, ICT networking and integrated safety and security systems, as well as social infrastructure, such as schools, clinics, open green space and shops. Ghana Home Loans will provide flexible financing solutions to enable Ghanaians to acquire their dream homes. The event was attended by dignitaries from government, the diplomatic corps and key stakeholders from the Ghanaian private sector.